CCAT-prime will be a 6-meter diameter, 10 micron precision surface telescope operating at submillimeter to millimeter wavelengths and sited at 5600 meters elevation on Cerro Chajnantor in the Atacama desert of northern Chile. 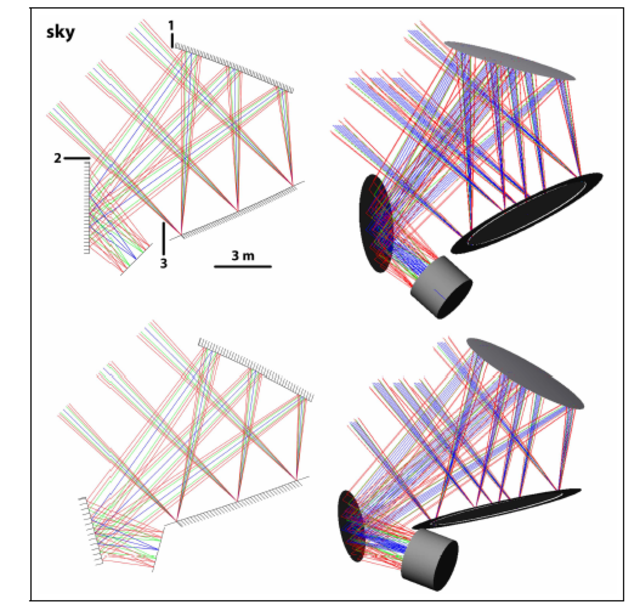 The novel crossed-Dragone optical design will deliver a high-throughput wide-field-of-view telescope capable of illuminating >105 (sub)millimeter wavelength detectors so that large areas of the sky can be scanned rapidly. The high altitude, dry site offers superb observing conditions, yielding routine access to the 350 micron atmospheric window as well as improved performance at longer wavelengths. Under the best conditions, observations in the 200 micron window will be possible. 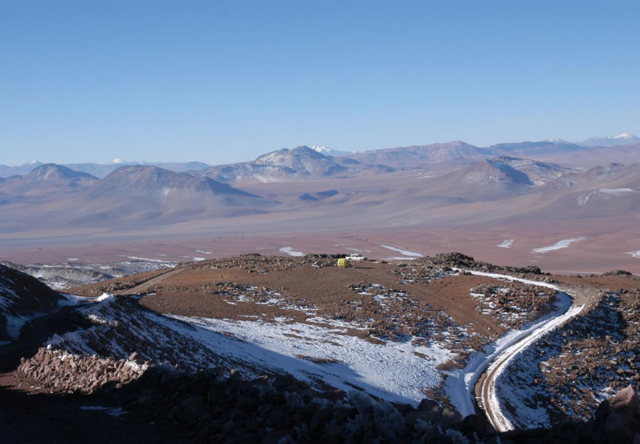 Deployment of CCAT-prime on Cerro Chajnantor will provide operational experience at high altitude, reducing risk for the future construction of a 25-meter class submillimeter telescope. CCAT-prime will be ideally suited, due to its low error beam and large field of view, to probe tracers of the ISM and cloud/star formation over a range of environments in the Milky Way, the Magellanic Clouds and other nearby galaxies. Spectral large-scale imaging with CHAI (a high spectral resolution heterodyne array receiver being built at the Universität zu Köln, see below) of fine structure and mid- to high-excitation CO lines will serve as diagnostics of physical processes associated with star formation over large spatial scales. CCAT-prime will measure the kinematic Sunyaev-Zel’dovich effect of galaxy clusters and will trace the appearance of the first population of star-forming galaxies through intensity mapping of their [CII] emission in the epoch of reionization. With CCAT-prime, scientists will be able to better measure the motions of clusters of galaxies under the influence of dark matter in relation to each other; study how galaxies and galaxy clusters first evolved; and study the properties of neutrinos, some of the lightest known particles. The “crossed-Dragone” design establishes the CCAT-prime telescope as a next-generation Cosmic Microwave Background (CMB) platform, capable of mapping the sky some 10 times faster than current CMB facilities. While other CMB efforts focus on wavelengths longer than one millimeter, the availability of simultaneous submillimeter imaging offered by CCAT-prime will allow precise separation of dust emission from the CMB signal. With its large flat focal plane, CCAT-prime will be ready to exploit the anticipated future advances in detector arrays. CCAT-prime is being constructed as a partnership of Cornell University, the Universities of Cologne and Bonn in Germany and CATC, a consortium of 10 Canadian academic institutions. Researchers at additional institutes in the U.S. Canada, Germany and Chile are involved in science planning and instrument development. 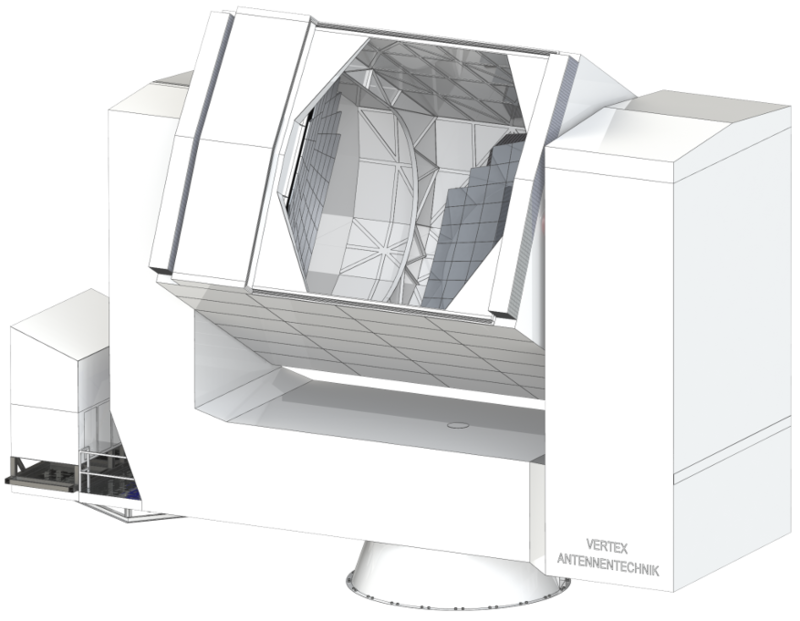 The telescope is being designed and built by VERTEX Antennentechnik GmbH. The construction phase will start in 2017 and is expected to lead to first light in 2021. Official press release of Cornell University. Official press release of Universität zu Köln and Universität Bonn. [CI] to trace cloud mass accretion, gas temperature and (dark) mass. Mid- and high-J CO/13CO to trace shocks and dissipation of turbulence, stellar feedback, gas excitation, density and mass. [NII] to trace embedded star forming regions and the number of ionizing photons. A dedicated monitoring of protostellar variability in the continuum near the peak of the protostellar SED on year timescales would provide a direct measure of the physical processes within the disk at ~AU scales, yielding important clues to the evolution of the protoplanetary disk. Maps at (15'' x λ/350 μm) resolution over 200 deg2 scales of the Milky Way (Galactic plane and Gould Belt), Galactic Center, and Magellanic Clouds (low metallicity). Large scale mapping of the full area in CO 4-3 and [CI] 1-0. Zoom-ins at higher frequencies (12/13CO 6-5, 13CO 8-7, CI 2-1). High site provides unique access to shortest wavelengths at 200 μm for limited time and area coverage (high-J CO and [NII]). Measurement of the velocities, temperatures and transparencies of galaxy clusters via the Sunyaev-Zel’dovich effect to place new constraints on dark energy and the sum of the neutrino masses. “Galaxy Evolution” studies of dusty star-forming galaxies far surpassing the Herschel results in number counts and directly resolving (and characterizing) the population of faint sources responsible for most of the FIR counts/background. Intensity mapping of the [CII] 158 micron line from star-forming galaxies in the epoch of reionization at redshifts of 5 to 9 to understand the topology and timescale of reionization. 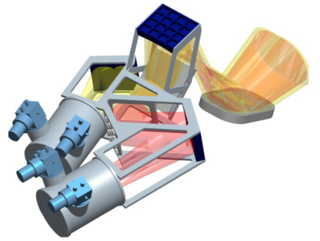 Its highly efficient mapping capability positions the CCAT-prime telescope as a platform for next-generation Cosmic Microwave Background (CMB) experiments (Stage-4 CMB mapping). CCAT-prime will provide ~10 times the current CMB mapping speeds, to enable probes of inflationary gravity waves and constrain the neutrino mass sum. CCAT-prime site below the summit of Cerro Chajnantor in the Chilean Andes at 5600 m altitude. CCAT-prime will be located near the summit of Cerro Chajnantor in the Atacama Desert in Chile. The extremely high elevation will allow observation of most northern and southern skies through all seasons due to the extremely dry atmosphere. Atmospheric studies over more than a decade at various sites includung Cerro Chajnantor and the ALMA site have shown that the CCAT-prime site has a median precipitable water vapor of 0.6 mm (vs. 1 mm at the ALMA site), thus giving a sensitivity gain of a factor of several (depending on wavelength) over ALMA. In addition, CCAT-prime will open the THz frequency range (the 200 μm atmospheric window) for about 10% of the time. A possible optical layout of a crossed-Dragone telescope. Light from the sky is reflected first off a primary mirror, then off a nearly-flat secondary (almost as large as the primary) and finally off a smaller tertiary. The combination permits a high throughput of the light over a very wide field of view and delivers a flat focal plane that can accommodate hundreds of thousands to millions of detectors. From Niemack (2016, Appl. Optics, 55, pp. 1688-1696; arXiv:1511.04506). Accommodates > 105 detectors at longer wavelengths and even more at shorter wavelength. Layout of CHAI instrument being built at Universität zu Köln. The two dewars are on the left and the telescope optics are on the right. Layout of CCAT-prime camera being built by Cornell University. Each sub-camera in the ring of six is interchangeable. p-Cam is a modular, wide-field imaging camera primarily designed to measure the kinematic Sunyaev-Zel’dovich effect of galaxy clusters. The camera has ~1.5 λ/D pixel sizes with near unit filling factor in the image plane and is diffraction limited at all wavelengths. Seven subcamera “tubes”, pixels with dichroic polarization sensitive TES (Transition-Edge Sensed) bolometers or KIDs (Kinetic Inductance Detectors). The CCAT consortium is a partnership of Cornell University, the Universities of Cologne and Bonn in Germany and CATC, a consortium of 10 Canadian academic institutions. Researchers at additional institutes in the U.S. Canada, Germany and Chile are involved in science planning and instrument development. On the German side, groups at the Max Planck Institut für Astrophysik (Garching) and the Ludwig Maximilians Universität, München have expressed their interest to join the project. Negotiations are underway.